I write these words in honor of perpetual change and our human capacity to fearlessly straddle multi-dimensional reality. As we move forward with great hope, we receive encouragement from our grander selves. These creator Gods within us all are constantly in action, trickling down love, energy and life itself. To them we are inextricably connected and I give great thanks. After having worked with the DreamWeaver for a year and just coming out of a major shift, (5-97), brought on by my own cathartic experience within the DreamWeaver, it seems no better time than now to write of my experiences with this powerful tool. We move through life at many speeds, each unique to the individual and particular experience. To be stagnant is to die. When we are ready, we shift into our new/present selves. It is my experience that many things contribute to our development, some things are subtle, others more direct. The DreamWeaver is one of those things that really grabbed me , allowing no time or need to resist, its potential so obvious after only 4 minutes. What I have learned is simply, that to release our deepest concepts of “Who We Are”, is to provide ourselves with a sense of true reality. That all is good and precisely right at all times. That our feelings of vulnerability and loss are key to our growth. Holding only slows the inevitable realization of who we really are. I am a light worker. A ten year Reiki practitioner and Master, an artist. The most important thing that qualifies me as a “healer”, is my life experience. Having worked through emotional trauma and loss, I knew that all of it had to have purpose. I’ve come to see it as my training to support others in their growth. I know through my own experience that we can only heal ourselves and that our most valid truth can only come from within. Had I not been challenged at a young age to discover this I would not have had the solid base to then work with Reiki and eventually the DreamWeaver. My unique way of extending light to others comes through my artwork. I create Healing Images to be used as open eye meditation pieces. A reminder; a visual soul impression of the person at his best. This image of themselves whole and empowered helps them to energetically remember their true higher nature, they become aligned with their soul essence. My other tool is the DreamWeaver, whose sacred space reached out and took me to a place of knowing, knowing that this was my work and that I had been guided through the artwork to this place. I now bring both these tools to the general public through health and healing expos., a local church task force on healing and spirituality, metaphysical bookstores and teaching centers, as well as local Boards of Health, Health Awareness Days and Hospital Senior Wellness events. This work is so exciting to me because I’ve been blessed with opportunities to insert my work, that of increasing the vibrational frequency of humanity, into mainstream consciousness. The DreamWeaver met me on the path in May of 1996. 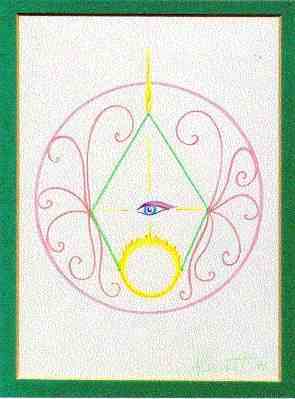 I had just drawn the image of a pentagon within a circle, at the sides were rose swirls of love, inside was the all-knowing eye. Two weeks later I was exhibiting my artwork. In the next booth was the DreamWeaver, a 12 sided sphere of pentagons. I was drawn to the beauty of it immediately still not realizing the significance of what had just entered my life. At the end of that day I entered the DreamWeaver for the first time. To me it was as if I had been given wings, life poured into me. There was a very strong knowing that this sacred space was what I had come to share. To me it was 10 Reiki sessions in one. Two weeks later I was putting together the dodecahedron and saturating myself with sound. My body responded to the tension in my back and in my heart. I thought I had gone through the losses and the emotional pain enough times to feel more comfortable with it bu my body was telling me otherwise. I found that my body had to move through it. Understanding this as a healing process I just went with it and let it talk to me. About 10 days later I felt clear. 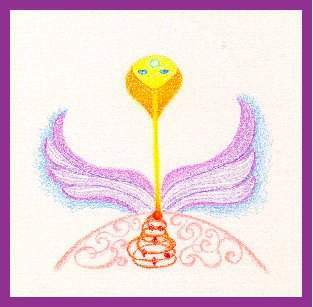 For myself the most significant shift came through a combination of tremendous trust in my facilitator Benedick, as well as my ability to “Dance” with the energy within the DreamWeaver, especially my breath. After working on myself extensively within the DreamWeaver, as well as having facilitated 65-70, 1 and 1/2 hr. sessions with clients, I found myself in a place of needing to be facilitated myself in order to go to those places that I could not yet see. The opportunity presented itself and I jumped. My analogy here is to a trapeze artist, except this stunt would be performed without the prior knowledge of the outcome. This can be scary, so my intention had to be TRUST. I am as of this writing still settling into the newness of each moment, (June 97). In the process I let go of so much of myself that I truly had no center and could only be still to see where I would land. My issues of abandonment, loss and grief were things I again thought I had worked on, when in reality I had looked at them but still carried them. As my body shook out on the table I realized how much I was still holding. Through my breathing and sounding, Ben’s encouragement and of course the music, these blocks were literally carried out of me, leaving what I experienced as a tremendous void. If in truth we are 99.9999% free space, then with me new awareness, what would I choose to fill that space with? Of course what came to me was sparking light and love, pure energy and vitality. As I see the moon rising now and am putting my thoughts to the page I realize with great relief that I will easily integrate with this new way of being. How Do I stay Clear? In order to work as a DreamWeaver facilitator and indeed to be effective in my everyday life there is the need to stay clear. For me this is about awareness first because with the broadness of perspective comes choice, understanding and peace. The more we stay in tuned with ourselves, our greater selves, the more naturally and effortlessly we flow with each moment. I’m sure I was like most facilitators when I first started to work with this special space. I wanted to know how, why, which one and when. My little mind grasping at every bit of information. Luckily aside from the words about it, the DreamWeaver has an education of its own for you, one that cannot be verbalized yet is the most significant in my mind. Here I am speaking of the magic. For me, as I released more and more of myself into each moment within the DreamWeaver I found that I could choose to do this more and more naturally outside of the space. So, as for clearing, I have moved from basking daily in the DreamWeaver to dancing in front of my stereo. The energy has truly moved into my spine and radiates throughout my entire field. I am able to consciously move old layers of my onion off of myself in rapid succession leaving a shiny new me exposed. This is great fun! It is very much like what I feel when I’m working with people, the most powerful waves being created by very clear people, energy workers and those who have remembered their connection. As a facilitator I have found that there are may different perspectives that we can have while doing DreamWeaver work. My intention is always to open the person’s heart to themselves. This is however also colored by my level of involvement, knowingly or unknowingly, and the ease factor. I am referring to dynamically moving energy. It can be manipulated or allowed to flow with intent. The ‘ease factor’ refers to how comfortably and easily I can help this person receive what they came for. When I look at the two words, sympathy and compassion, I find that although they are somewhat synonymous, my lean is to see sympathy as a more affected place. The facilitator takes into his field in some way the vibration of the other. My own experience of this is that during a session I would quite spontaneously meet the vibration of the client and naturally raise the frequency. If I got stuck it was because I myself still had work to do on that issue or energy center. I was thinking myself clear instead of reeling in the GRACE. This took much longer and was much less comfortable. The word compassion is more of a centered place. A place of holding the light for another in a way that does not require the change in frequency. I hold the image in my heart’s mind of the other person at their best. This opens the door energetically for them to step into that probable reality. I have no need to protect myself in any way from taking on their stuff because I’ve stepped out of the loop. I am present for them in the capacity of my highest self. “There is nothing that I am not”, is how it was put to me by spirit. I have mentioned earlier that I believe all healing comes from within. I have found that I love to talk to my clients about their perspectives on life, however I can say that the most significant bits of information come from within each individual. Here are a few that come to mind. All I have to do is give myself PERMISSION! I never knew that all I ever really wanted was PEACE. Someone is saying “I love you”. There is a part of me that is always whole, I had forgotten. I am my own child. The idea is not to heal. The idea is to LOVE! No one particular event is any more useful or significant than any other. I can love myself just as I AM. How much do you trust the universe? Simultaneous realities, simply change the channel or use simultaneous viewing. Let it go! You’ve got it! We’re all ignorant in some way, and that’s loveable too. If my hair is falling out, then I’M not growing. I can unconditionally LOVE MYSELF. Everything is a choice, and they are all “good”. Stop pretending you don’t know who you are. I am as wise as the wisest being that I have ever known, physically of otherwise, and I am as confused as the most mixed up client I have ever had. In my practice I primarily see women. I have to say that I’ve come up with what might seem to be a rash generalization but it is obvious to me energetically in as much as 80% of my clients. 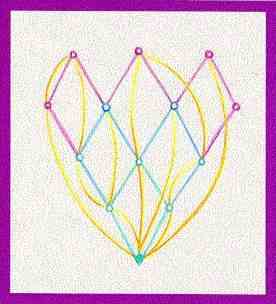 The pattern is this: impacted energy around the throat is reflected by impacted energy around the 2nd chakra. The opposite colors, blue and orange, going around and around without getting anywhere. The desire to be accepted has led many not to speak their truth and therefore they are not particularly fruitful with physical creations either. I have seen this dance of opposing colors in cases of extreme fear also. The lack of red, safety and courage, creates on the other end, the head with falling hair, and the lack of perceivable access to spirit, violet and white. The DreamWeaver has certainly opened my throat. As I have become more and more comfortable with the work I’ve found that I unconsciously have begun toning during each session. I encourage each person to use their voice during the session as well. If they are unsure I invite them to hum at first. Their participation being a sure way to move things along. I am trying to teach people that they need only to remember that they can rearrange themselves energetically whenever they desire with the use of sound, particularly their own voice. For myself I’ve found that I tend toward singing harmonious, sustained tones during my work, I’ve also found a single clap useful in quickly reconfiguring energy. Other sounds that seem to come out are a deep buzzing sound and a guttural clicking sound. These effects have come about spontaneously as spirit takes over the session. At one point Benedick asked me to see what I might see in the DreamWeaver environment while I was with a client. The client, we’ll call her K is really a loving, sensitive sort. Off nurturing others and generally a little timid toward her life, still seeing herself as a victim in many ways. Most of the colors that I saw with her were soft greens and roses, some peach. This particular day she was in the middle of her 5th session. I turned around remembering to ask for an image for K. I have to say I was quite surprise: when the enormous cobra lifted its head. My understanding of this seemingly contrasting image is that it truly represented her antitheses and therefore what she needed to integrate. It is interesting that she has not come back for her 6th session though she has paid for it. I assume she has not integrated with her power. 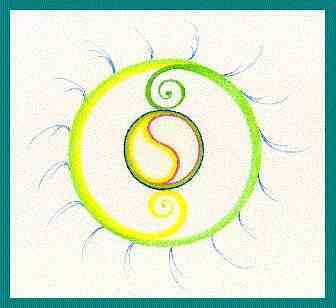 Another image that came to me personally while in the DreamWeaver is the one representing POSSIBILITY. The turquoise diamond at the bottom is me. My realization, that I can virtually go anywhere, being represented by the inter-connected diamonds. My possible choices showing as the yellow lines. I can then see myself moving to the higher planes, the violets, in any combination I choose. This made me laugh out loud realizing it is just that simple. The final image (below) is one that I received while my intention was BALANCE, a favorite one of mine. I was reminded of the beauty of balance while I had the DreamWeaver at a center doing 5 minute intros. Two little girls were off to the side, they were about five. I invited them in, as they moved nearer, the bubbly one jumped onto the mat, tipping back and landing on the floor on the other side. The other came over with a little encouragement. The girls were twins. The mom shared with me that the one that bounced off the floor was hyper and on medication for this. The second child was quite serious and seemed almost disturbed by life. After the first few minutes, the serious twin climbed out. I changed the music to Michael Franks, String of Pearls, a lovely soothing song about hearts. The bubbly child lied down on the mat, knees coming up to her chest. Within the first minute the serious twin asked to come back in. She climbed in as her sister gently moved over to share the space. They faced each other mirroring in posture. They reminded me of the two sides of a heart, together they made perfect balance. The mom was so surprised by this saying she had never seen the bubbly twin this way. After they had left I wished I had suggested that the children sleep together with harmonious music to fly by. I wanted to share this story because it is so analogous to how I see the DreamWeaver works with individuals. They find their balance, quite naturally, remembering their connection to spirit, to the silent receptive side of themselves, to their SOURCE, to the real magic that they are! The most important concept that I see shifting in the world of healing is that someone else or something else heals us. This thought form encourages people to give away their power. I see centers for healing in the future as places where each individual is trained to be a healer, but that it is clear that the only client they will ever have is themselves. This puts humanity back to unity. Each person healing themselves in turn heals that aspect in all of their surrounding reality. If we are to be guides for others in the “How To” of wellness there can be no room for ego, in the sense of taking credit for another’s state. So in my future I will be part of a group dedicated to nurturing awareness of the whole, the holiness of life. This will be a place where people will be reminded of their responsibility for everything they perceive as their lives. The connection to our higher aspects will be facilitated through sound environments such as the DreamWeaver. Sacred Geometry will be used to encourage interdimentional work and sunlight reflected through crystals into the eyes will feed frequency imbalances and depletions in the field. Love will be the primary tool in this environment. Self love will be generated through beauty. Creativity will be emphasized as a way to find the love and harmony that exists in us all. DreamWeavers will be used by all who do medical work to clear and center themselves before they do any work on the physical form. Love will abound. Disharmony will be a remembered act of the play that can be experienced by choice but that is no longer the norm. We will be operating at out highest potential thus encouraging other to do the same. Not everyone I’ve worked with has been as ripe as I was for growth, but with my experiences of the past two years I have received a tremendous gift. I can now hold for others the space that naturally allows a non-judgmental assessment of self. Pure love is what is remembered and nurtured in anyone who has the privilege to step into this magical space. So my intention as I continue to facilitate others is to open their hearts to themselves, to see them let go their hold of that trapeze bar of their personal reality long enough to grab hold of their present/future selves. 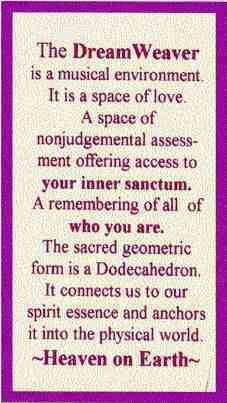 To bring this loving being that they are clearly into focus that it may permeate their entire lives! To Ben, I would like to say Thank You ! My ability to know myself has been greatly enhanced by your gift to the world. This article is copyrighted, all rights reserved. However, you may use in whole or partially provided that the thoughts, ideas, and or facts are not taken out of context and remain faithful to the meaning, intent and scope of the original. Proper credit must be given to the author.